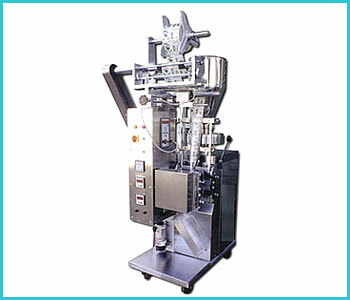 Form-fill-seal pouch packing machine is ideal for Tea, Coffee, Rice, Detergents, Spices, Sugar, Salt, Nuts, Milk powder, Chemicals, Mehndi, Gutaka, Pan Masala, ORS, Herbal Powder etc. Sealing patterns available is center seal, three side seal, and four side seal. Photocell control penal is given for accurate positioning of printed photo mark. Digital temperature controller is used for perfect Vertical and Horizontal Seals. Heater Indicator Lamp or alarm System if any one heater fails the machine automatically stops or indication lamps indicate on control panel.